Interstitial cystitis (IC) is a chronic, functional pain syndrome characterized by urinary frequency, urgency, nocturia, and, most importantly, pain or discomfort associated with bladder filling. The pathophysiology of the condition is still poorly understood, but recent research has shed a great deal of light on the epidemiology of IC, its clinical course, and associated comorbid functional somatic disorders. The classic finding of “bladder ulcers” is seen in the minority of IC patients, with differing management for those with and without ulcers. IC remains a diagnosis of exclusion, but recently released guidelines by the American Urological Association provide a clinical algorithm for the evaluation and management of IC. The current trend is towards less-invasive diagnostic studies and limiting the number of different agents used to manage IC symptoms, while discontinuing the use of any treatment that is not deemed successful. 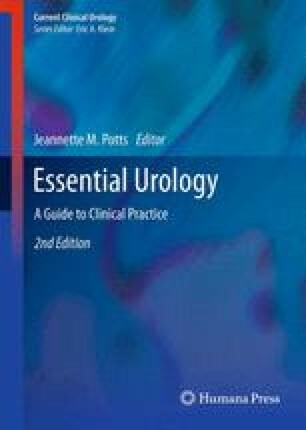 Furthermore, the guidelines, which are reviewed in this chapter, promote a multimodal approach towards therapy, including noninvasive treatments such as stress management, more focused pharmacotherapy, and pelvic floor physical therapy. Dawson TE, Jamison J. Intravesical treatments for painful bladder syndrome/interstitial cystitis. Cochrane Database Syst Rev. 2007;(4). Art. No. : CD006113. doi: 10.1002/14651858.CD006113.pub2. Rackley RA, Vasavada SP, Daneshgari F, et al. Neuromodulation for interstitial cystitis. 2005. http://my.clevelandclinic.org/Documents/Urology/AUA%20Abstracts%202005.pdf. Accessed 20 Feb 2012.